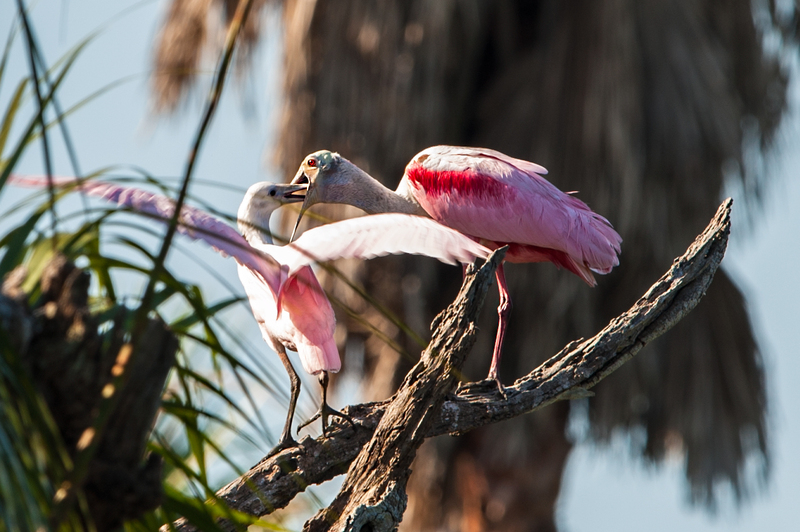 While in Florida in May, I photographed several mated pairs of Roseate Spoonbills. 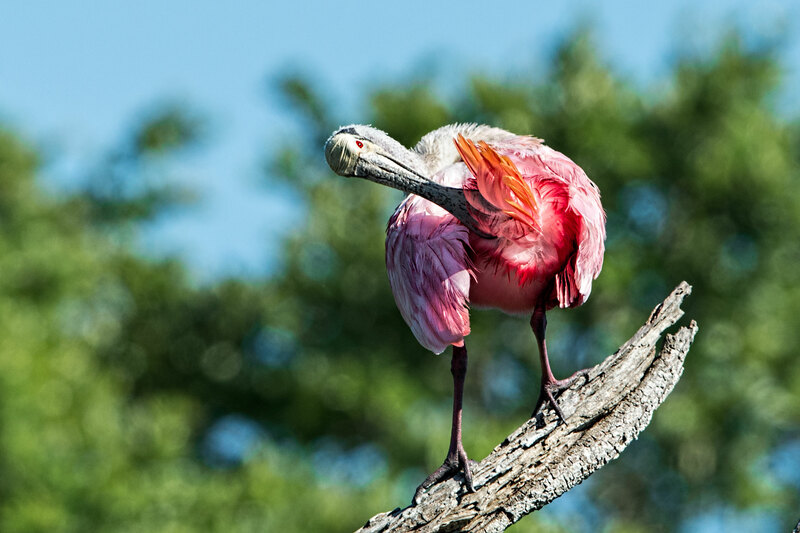 I was excited to see so many spoonbills and watch their behavior, and tried to capture some unique images. 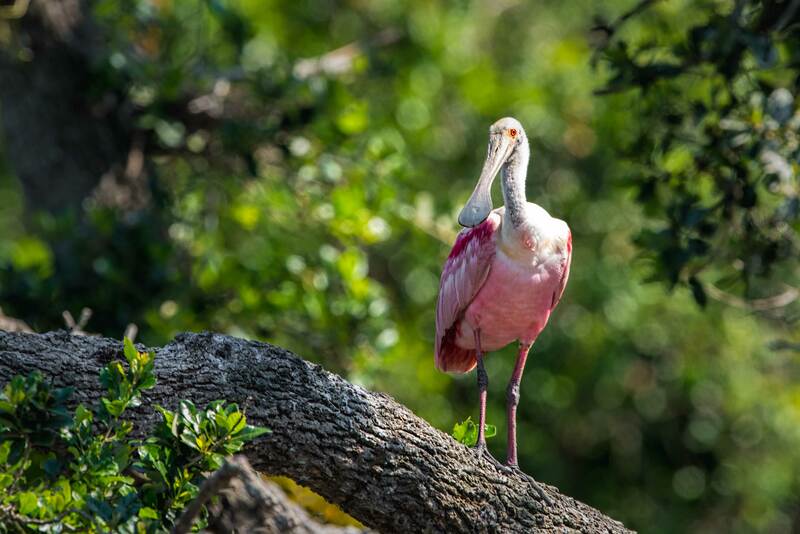 The spoonbill pairs were in different stages of mating, nest building, and raising young. There were a few pairs that were building nests; some with young chicks in nests; and at least two pairs’ young that had recently fledged, but were still at the rookery being fed by their parents. Therefore, there was plenty of activity and many photography opportunities. 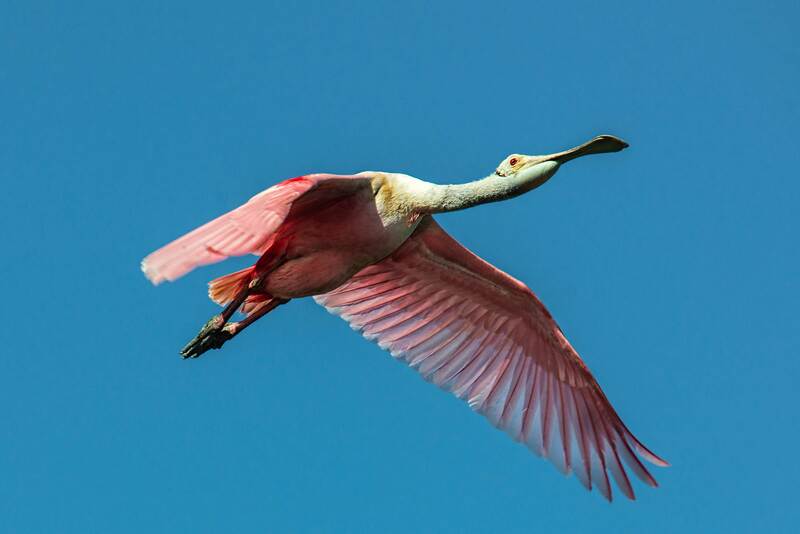 However, the spoonbills did not always cooperate (e.g., hiding in shadows, flying in the wrong direction, partially hidden by branches or leaves). 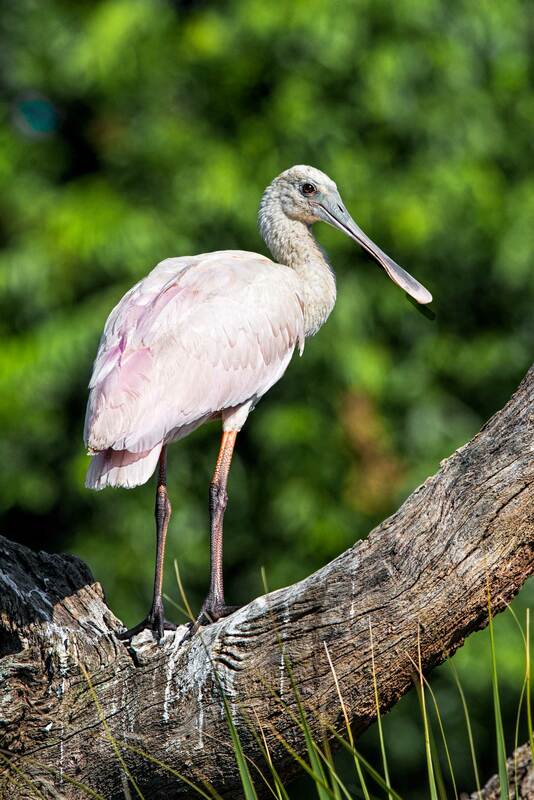 Roseate Spoonbills are large wading birds, spending most of their time in shallow water feeding, except when raising young. They are interesting to watch as they hunt for food (small fish, shrimp, mollusks, snails and insects), because they sweep their spoon-shaped bills back and forth in the shallow water for food. Scientists believe their pink and red colors are derived from some of the crustaceans that they eat. 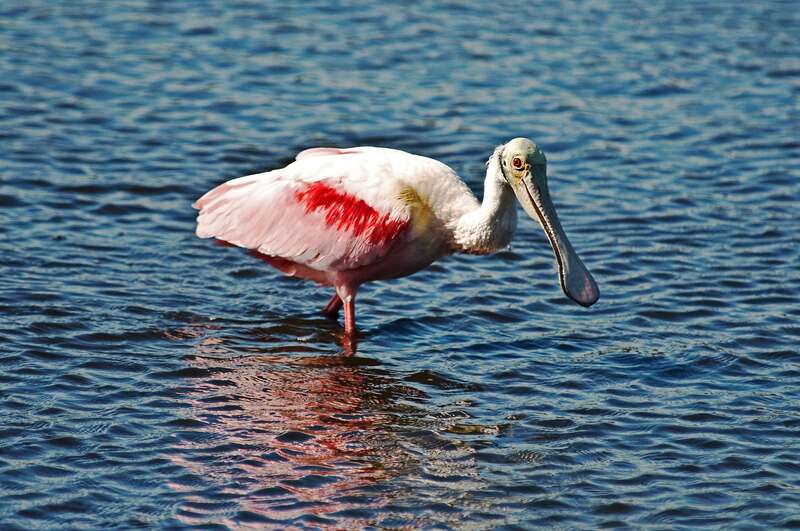 Besides their obvious red, pink, and white feathers, they have orange tail feathers, which can be seen in the above image and the last image. 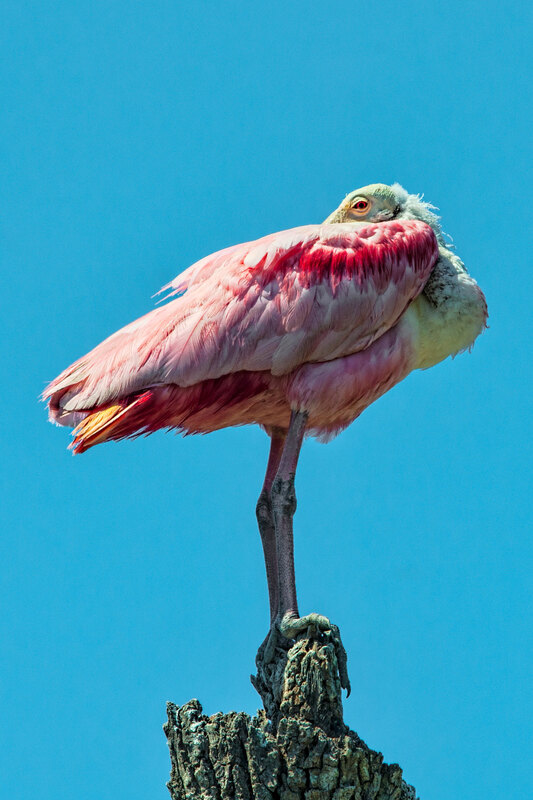 I really like the above image, even though the spoonbill’s unique bill is hidden, because of its “pose” on the tree stump and while trying to sleep, it kept a close eye on me from time to time by looking over its back when hearing my camera’s shutter. 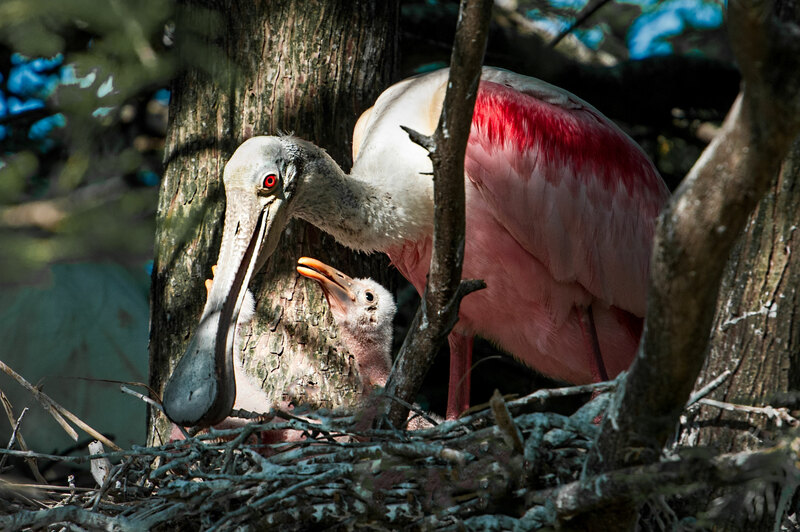 As you can see in the above closeup, Roseate Spoonbills have bright red eyes and both male and female adults have no feathers on their heads, which contributes to their very unusual appearance. 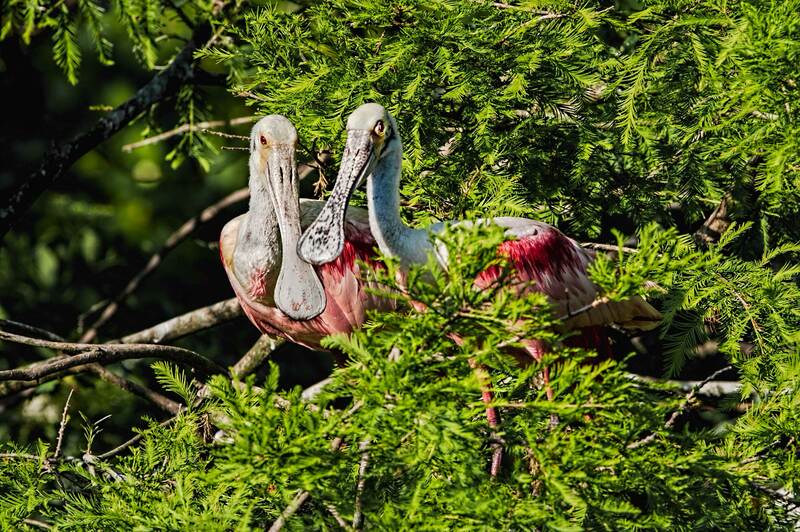 Above and below are recently fledged spoonbills. Their colors are muted, and they still have soft white feathers on their heads. 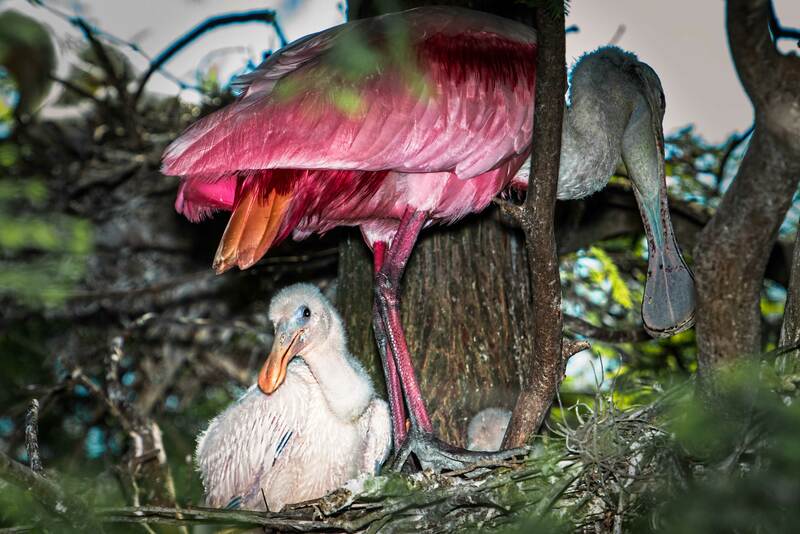 As mentioned above, a couple of the Roseate Spoonbills pairs had young in their nests (below). The young in the next images are about two weeks old. One of my favorite images is below showing the pitiful look on a hungry chick’s face looking up to one of its parents, wanting to be fed, which is what all young birds are constantly demanding. 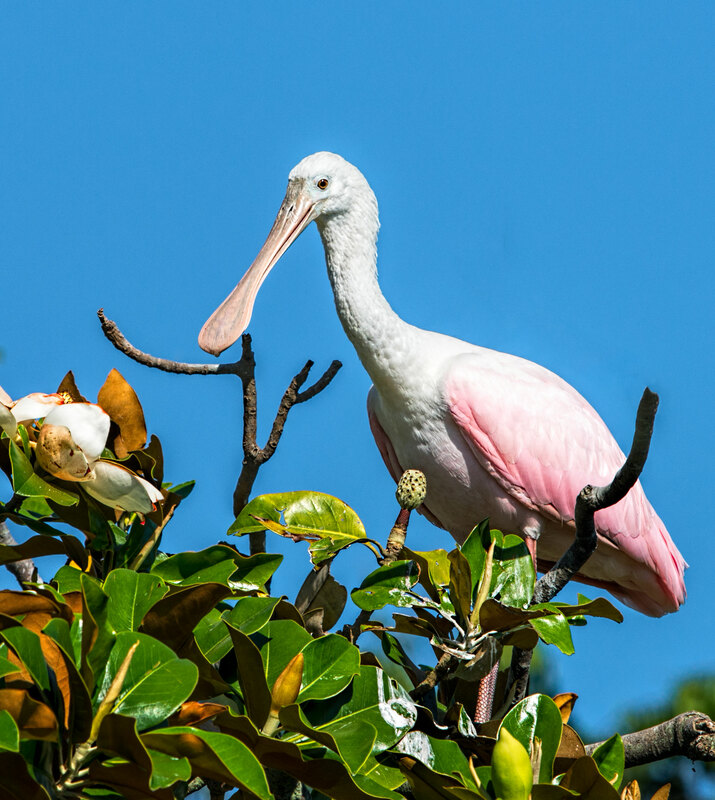 Both the male and female spoonbills take turns on the eggs (usually 2 to 5) in the nest and both will take turns looking for food and feeding their young. A couple more images follow of a pair that were building a nest deep within a tree. The loving couple pose above. Below are a few more images. Above, a fledgling is being fed. Unfortunately, I only had one opportunity for this shot, because as I came around to the right to eliminate the foreground trees, the spoonbills quit feeding and flew away. 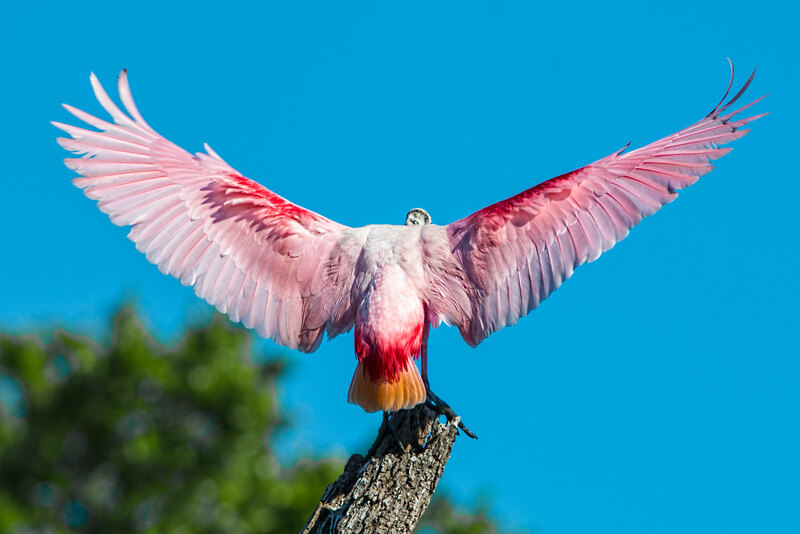 Below is the perfect image to end this blog article, since it is a tail-end view of a Roseate Spoonbill showing its colorful wings and bright orange tail. 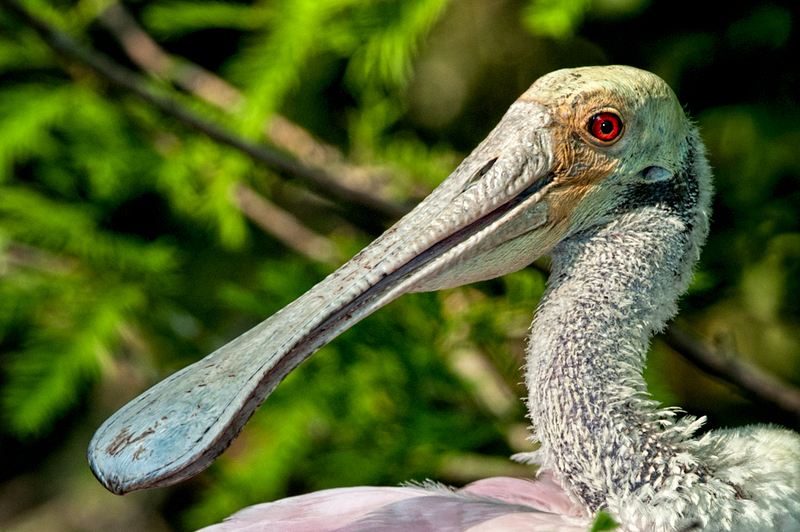 They are very unusual and oddly beautiful birds–Mother Nature has quite a whimsical imagination. One more…this is the end. 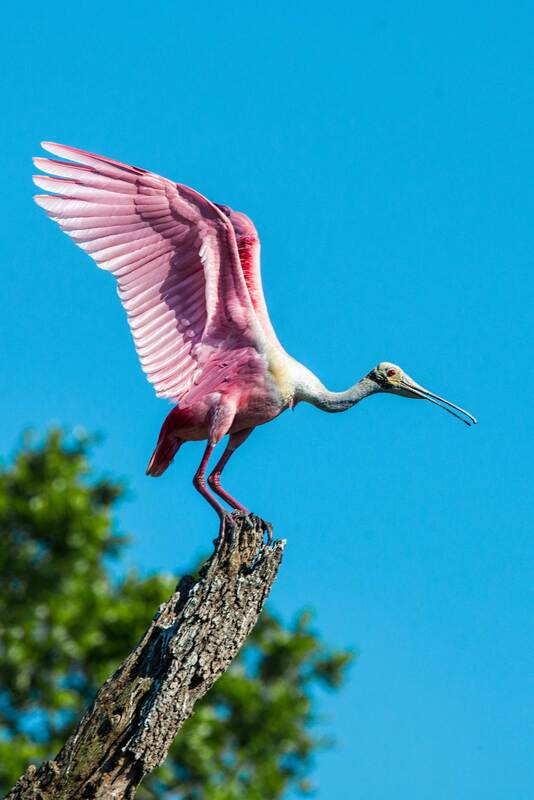 This entry was posted in Bird Photographs, Nature, Wildlife and tagged Roseate Spoonbill. Bookmark the permalink. 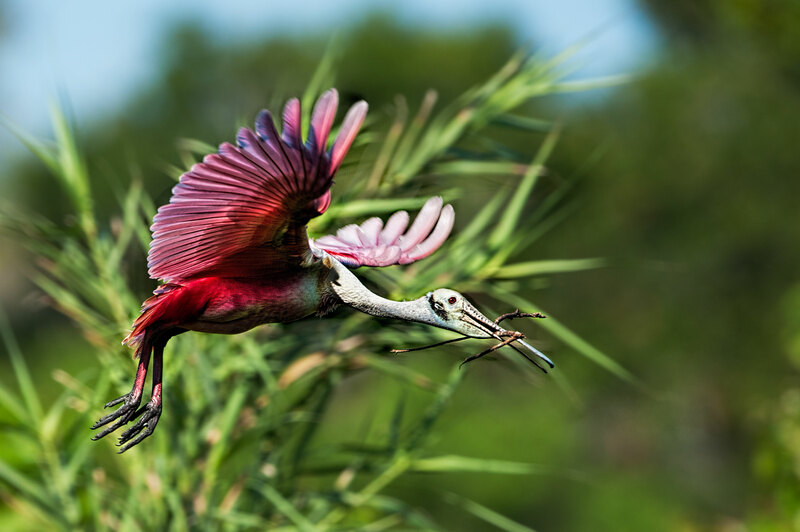 Beautiful Roseate Spoonbill pictures and article you created. “They are very unusual and oddly beautiful birds–Mother Nature has quite a whimsical imagination.” You nailed it perfectly. You are spelling it correctly. Unfortunately, I did not, but it has been fixed. I relied on a poor Google search. Oh well, it has been corrected. Thank you Kee. 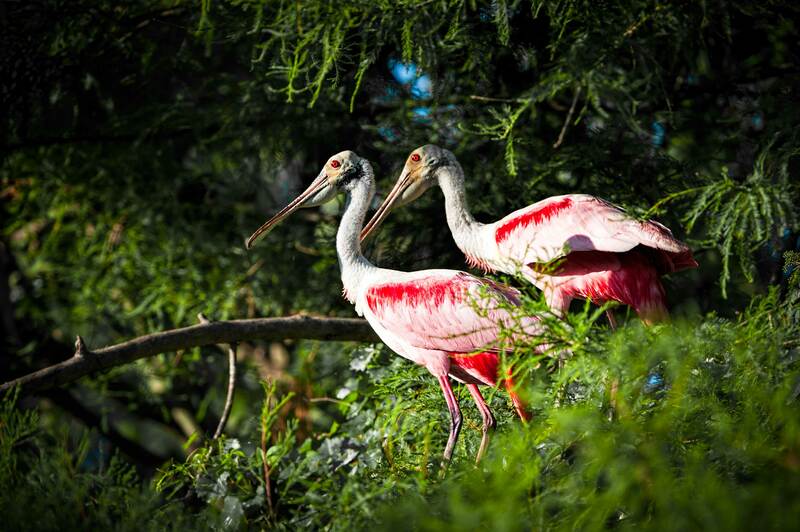 As always…..great photos….. We did not see very much wildlife on our trip. That was disappointing. I did get some nice shots of the beautiful scenery…..mts, geysers, forests, canyons and some city and village scenes…..It was a great trip. Take care …. 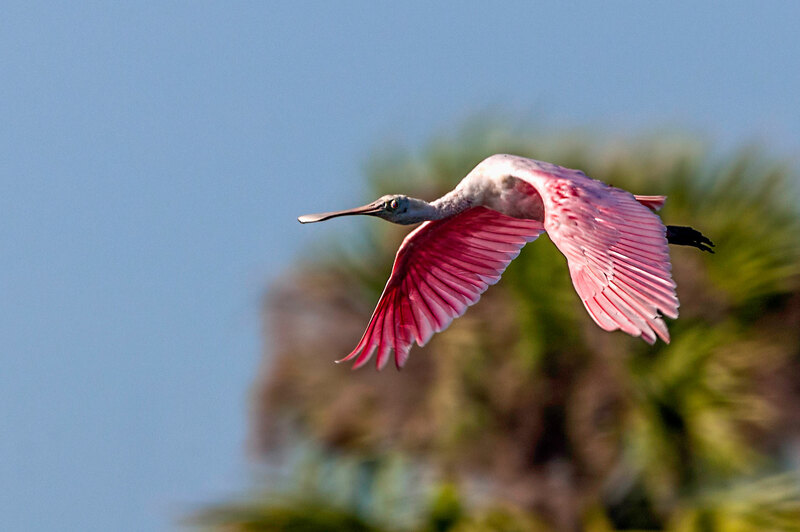 How lucky you are to capture these beautiful birds. So wonderful done. I love seeing the details and colors of feathers. Great poses. Your photos are incredible! Did you have to stand in the water while photographing the birds? I love seeing the details and colors of feathers. Great poses. Your photos are incredible, Stephen! Did you have to stand in the water to take these photos? You had a good morning at the Farm! I like the baby shots best. Let me know the next time you head to Florida! Beautiful shots! I don’t see them often enough! 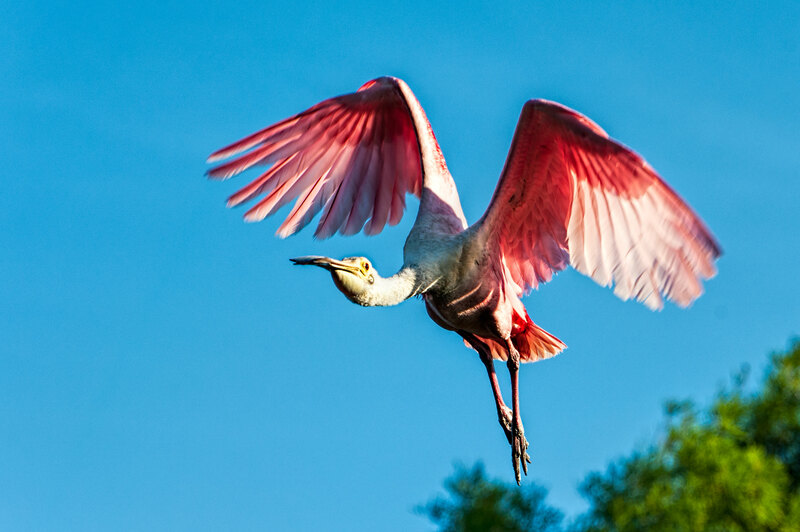 Amazing birds, beautiful photographs and interesting info. Thanks, Steve! Absolutely gorgeous photos … as always! And I love your commentary, too! So informative. Amazingly beautiful yet odd birds! Wonderful photos and information. Love reading your blog!